Swine influenza (also known as "pig flu"), is an influenza virus that can appear in pigs. Usually, pig to human or human to pig transmission is quite rare. When this does happen, it is considered a zoonotic flu. Zoonotic diseases can be transferred from animal to human. There have been only a few major outbreaks in the past century, usually always beginning in North America. Swine flu is very common among pigs, but risks can be reduced by giving a herd of pigs vaccines. Influenza A is transferable from human to swine and vice-versa. The one that is causing an epidemic in 2009 is influenza A, subtype H1N1. To stay healthy and keep away from this, keep good hygeine. This includes washing hands frequently, using alcohol-based hand sanitizers, avoiding "swine flu parties", staying away from large crowds, and always cover your mouth/nose when coughing/sneezing. Treatments are available to help reduce symptoms and keep them from worsening. There is a history of swine flu pandemics that have broken out in different regions of the world before the one that broke out in 2009. During this time, in the Philippines, about 10% of pigs died. The National Meat Inspection Service (NMIS) raised the flu outbreak in pigs to a "red alert" on July 27, 2009. There are three main classifications of swine influenza including: influenza A, influenza B, and influenza C.
H3N2 has been found to have avian, swine, and human genes all mixed into one. This virus can affect birds, pigs, and humans. Many symptoms of swine flu are similar to the seasonal flu, with a few exceptions. Symptoms that one might have when he/she has a cold are often present which includes: coughing, runny nose, and a sore throat. Other symptoms present: fever (not necessarily in all cases), aching body, headache, diarrhea and vomiting, extreme tiredness, and chills. These are all symptoms that are commonly found in many swine flu cases. When someone has respiratory problems or pneumonia, that is a more serious case of the H1N1 virus. People who have chronic medical problems, obesity, and pregnant women are at highest risk for catching swine flu. Serious swine flu symptoms include: trouble with breathing, persistent vomiting, little interaction, extreme irritability, and not enough drinking enough fluids. History of Swine Flu Outbreaks by Rosemary E. Bachelor, April 27, 2009. Swine Flu Symptoms-Symptoms of Swine Flu-H1N1 Virus-Swine Flu News by Michael, May 11, 2009. Obama Declares Swine-Flu Emergency by Betsy Mckay and Cam Simpson, October 26, 2009. Swine Flu-Facts and Treatments by Mentor Mala, April 26, 2009. 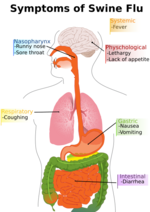 Swine Flu Symptoms by Vincent Iannelli, M.D., October 22, 2009. Key Facts About Seasonal Flu Center for Disease Control and Prevention. Prevention and Treatment by Flu.gov. NY Times-Debating the Wisdom of "Swine Flu Parties" By Donald G. McNeil Jr., May 6, 2009. 2009 H1N1 Flu and You by Center for Disease Control and Prevention. 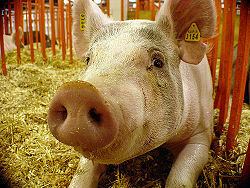 Swine Flu in Pigs FAQs April 2009. More human-to-pig flu transmission seen likely May 27, 2009. Zoonotic Disease Tutorial by Christopher W. Olsen, 2000. Classification of Swine Flu May 3, 2009. Influenza Type C by Organized Wisdom, 2009. 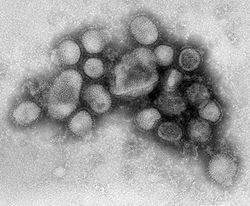 2009 H1N1 Influenza A Virus by USDA. This page was last modified on 17 November 2015, at 16:21.